The Northeast Woodland tribes lived in wigwams or longhouses, hunted and fished, and grew crops like maize, beans, and melons. Some of the tribes were very warlike and others were more peace loving. The region of the Northeast Woodland Indians extended from the Great Lakes to the Atlantic Ocean and from Southern Canada to northern Virginia. This map shows the regions of the various native American groups. Within each of these regions are hundreds of tribes. Some of these tribes made alliances or conquered one another and became confederacies. Image released to the public domain, Wikimedia. Within the Northeast Indian Tribe region were hundreds of distinct tribes who spoke different languages, had different customs, wore different styles of clothing, and lived different lifestyles. There really is no way to study “Indians” as a whole group or even a region as a whole. Instead, choose a single tribe or confederation and study that one tribe in detail. 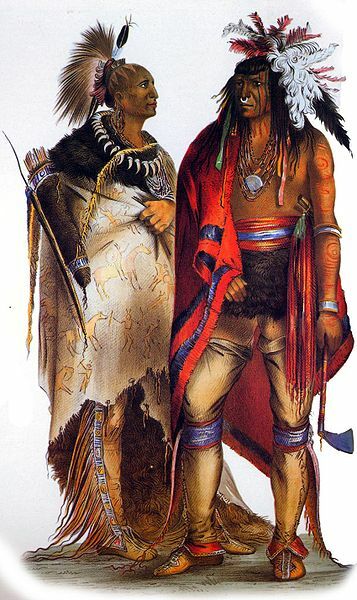 These are men of the Iroquois Confederacy. In this image they are arrayed in their battle gear with their honors showing. The paint, jewelry, and feathers are symbolic of achievements, mostly in battle. But they didn’t wear all of this every day. We recommend reading short descriptions of several tribes and then picking one to do further research on. Once you have chosen your tribe head to the library and find information on them (parents will want to check ahead of time and make sure that the library has a selection of books on various tribes to choose from). If you can’t find information at the library on the tribe you chose, ask the librarian for help. If they can’t get you the information you need, choose a different tribe. You can also find information about the tribes online. As you read, look for information on the culture of the tribe. Here is a Indian Tribe Research worksheet to fill in and take notes on. You will use the notes to write a paper about the tribe. Older kids can do the same project but without the printable note taking helper and in much more detail. After you have finished reading and taking notes write a report or research paper about the tribe including information on each of the things listed in the worksheet. For 3rd grade to 5th grade this paper should range from one sentence per topic to a few sentences per topic. 3rd graders may need instruction or reminders about the structure of a paragraph. For 6th to 8th grade the kids can write one paragraph per topic. For high school the informational part of the paper is similar to a middle school paper, but analysis (what the student thinks about what they read) should be added, along with quotes from sources (properly cited), and a bibliography containing at least three sources. Next have the kids use what they learned to create a project about their tribe. Karen’s Big List of Book Projects could provide some inspiration. You might also pick something that is specific to your tribe. Maybe they used a peace pipe or had a ceremony for the dead that interested you. Create a project around that. Present your project to an audience and read your paper. You can, of course, use this worksheet for learning about any American Indian tribe. We recommend learning about a tribe that lived in your state. The Wampanoag were the people who first met the Pilgrims. Find out more about their meeting. The Powhatan were the confederation that lived where Jamestown was established. Learn about relations between the Indians and the settlers. Many people say that the government of the Indian tribes, especially the Iroquois confederation, was the inspiration, at least in part, for the form the United States government eventually took. Learn about the connection and see for yourself.